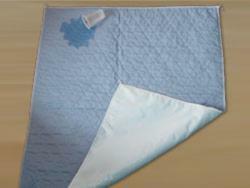 Our Wetness Indicator Pad is made with ultra-soft sheeting, quilted to a blended soaker and a knit back vinyl barrier. When maintaining dry skin is critical, turn to our Wetness Indicator Pad. Our pad alerts the care giver that it is time to change pads by turning deep blue.